Our last DELVE Networking event of 2013 was a great one on November 21st. 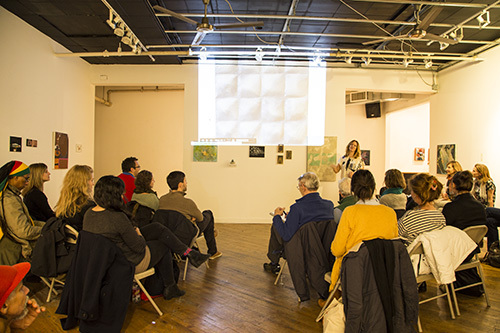 We were really happy to host the event at Brooklyn Art Space's (BAS) Trestle Gallery in our neck of the woods, the Gowanus neighborhood of Brooklyn. We really appreciate BAS since their mission is to help artists and create community, just like what drives our DELVE events. In addition they provide affordable studio space, workshops and great things like open critiques. They are a great resource. Our two guest speakers for the night really inspired the crowd with their work, sense of humor and insightful look into their professional paths as artists. First, Gina Beavers, a talented painter and teacher, talked about different projects and techniques in her work, and what she uses for inspiration, such as images sourced from the internet. Gina is based in Brooklyn, NY and has a BA in Studio Art and Anthropology from the University of Virginia, an MFA in Painting and Drawing from the School of the Art Institute of Chicago and an MS in Education from Brooklyn College. She has an extensive exhibition record and let everyone know that her first big shows developed from what we were all there in the room to do: networking. That has led to reviews in the New York Times, Artforum, The New Yorker and Modern Painters, among others. Her work is smart and incredibly painted, and we were really excited to hear more about her process. 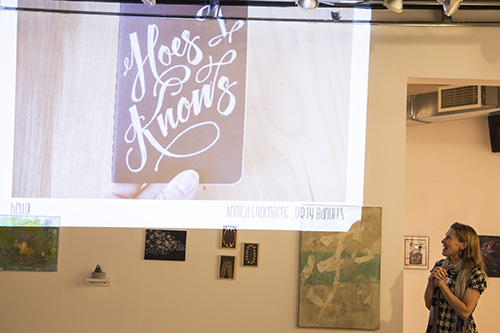 It was great to see the path of Annica Lydenberg from Dirty Bandits through a fun journey in pictures of how she got started and found her true passion: type. Annica is a Brooklyn-based designer, illustrator and screen printer with a deep obsession with type as art. Each word she draws is treated as image in and of itself rather than a word rendered in a particular font. She works with screen printing, painting and pen and ink, pulling stylistic influence from an ever growing library of found type. Annica started as a designer and was brave enough to show us some really, really (hilarious) early work from her commercial design career so we could see just how far she has come. Always a self-starter, she sells her work on-line and in local stores, has trained with professional sign painters in San Francisco and is working on some really cool projects. You will definitely want to follow her on Instagram to get your daily dose of witty, gorgeously painted words and keep up with all she has going on. Check out some more photos and below and be sure to join us for January's DELVE event. Sign up for our mailing list to learn more. Thanks to our speakers, Brooklyn Art Space and all of the creative forces in attendance. We look forward to seeing you again soon!